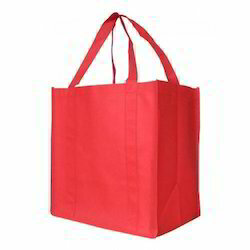 We are a leading Manufacturer of eco friendly shopping bag, non woven t-shirt bag, food bag, laundry bag, non woven bag and non woven d cut bag from Rajkot, India. Non-woven manually stitched bags offered by Karam Green Bags are manufactured using best quality raw material and supervision of skilled operator. High strength, durability and carrying capacity are distinguished characteristics of manually stitched bags offered by Karam Green Bags. These bags are available with customer’s logo or massage printed on it. 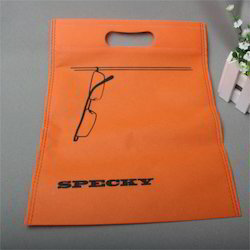 These promotional bags are available in lots of fascinating colors and style. Further Karam Green Bag also offers three different printing options i.e. Screen, Flexographic or Offset printing. We are recognized as one of the most valued Ultrasonic welded Non-Woven W / U Cut Bags manufacturers in the country. 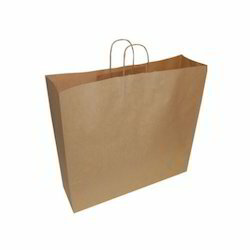 Some of the essential features of our non-woven bags are high strength, maximum space, and cost effective prices. 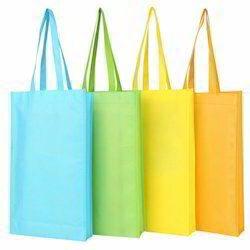 We are one of very few organizations who are providing non-woven carry bag with multi-color printing. Sizes: 10" x 12", 13"x16", 16"x20", 18"x18", 22"x22",17"x23", 20"x24", 24"x30"
Our company is engaged in offering a wide range of Food Bag to all our customers. With compliance to the international quality standard, we manufacture and design these Canvas Bags. The raw materials used are of best quality and are procured from most trusted vendors. We provide personalized service and high attention when our products are directly affecting the status and market image of our hotel and resort clients. We manufacture non-woven bags which are suitable as a newspaper bags, laundry bags, shoes bags etc. Our bags are manufactured using high quality raw materials which are long lasting and re-useable. We have immense expertise in supplying Non-Woven Fabric Bags, made by bonding the entangling fibers together. These fabrics are manufactured using recycled fabrics and oil based material, which add to the quality of our product range. 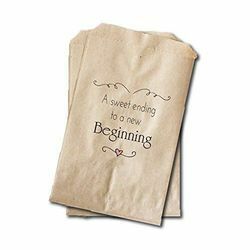 With the help of our state-of-the-art infrastructure unit, we are able to manufacture and supply the superlative quality of Non-Woven Bag. Widely used in various places such as malls, retail shops, etc. for packaging purpose, this bag is manufactured from superior quality raw material and advanced technology. Moreover, the offered bag is well tested by our quality experts to maintain the quality and are available in various specifications to cater the diversified requirements of the clients. 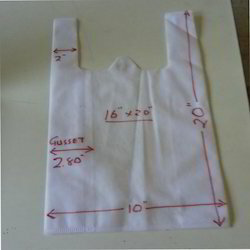 With our domain expertise, we have been able to offer a wide range of Ultrasonic welded Non-Woven Fabric “D” Cut Bags. These products are developed as per the set industrial norms and standards by making use of high grade material. These product can also be customized as per the client’s specific needs and demands. 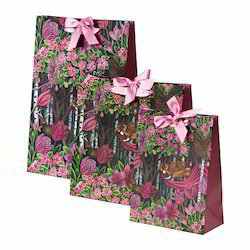 “KARAM” as a brand is very popular for printed D-cut non-woven bags available with up to 4 color flexographic printing. Sizes: 9"x12", 10"x14", 12"x16", 14"x19", 16"x21"
We are installed with brand new Indian made four color flexographic printing machine. “KARAM” as a brand is very popular for printed non-woven bags available with up to 4 color flexographic printing. 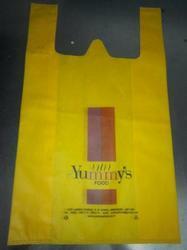 We are presently serving many corporate for their requirement of quality printed non-woven bags. Karam Green Bags is CRISIL certified company having infrastructure and capacity to meet any kind of big or small production requirement of printed bags. 10"x12", 13"x16", 16"x20", 18"x18", 22"x22", 20"x24", 24"x30"
We manufacture and supply a comprehensive range of Non-Woven Fabric Bag that is made of reusable and Eco-friendly propylene. These Non-Woven Bags are widely demanded owing to their features of durability, liquid resisting, and dehumidifying nature. We are installed with brand new four color flexographic printing machine. “KARAM” as a brand is very popular for printed non-woven bags available with up to 4 color flexographic printing. 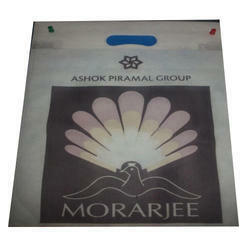 We are presently serving many corporate for their requirement of quality printed non-woven bags. Karam Green Bags is CRISIL certified company having infrastructure and capacity to meet any kind of big or small production requirement of printed bags. 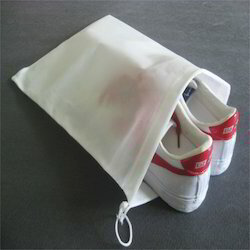 Maximum printing width of non woven fabric is 50"
We have a wide range of Shoe Bag in quality materials. This bag is crafted with the latest designs and can be customized. Karam Green Bags is popular to produce different size (any kind of small or large) of bags to fulfill the need of the customer. Priced competitively, these bags are delivered to our clients within the determined time frame. We are pleased to present an extensive collection of Colorful Fabric Bag, which is manufactured using quality grade raw material. 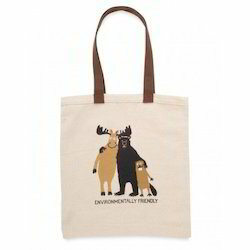 These durable bags are reusable and find extensive usage in day to day activities. 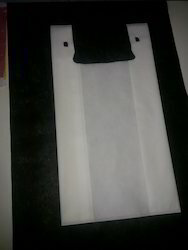 We offer these fabric bags in standard as well as customized forms so as to meet the diverse needs of our clients. We are an acclaimed name engaged in offering our precious clients a superior quality range of Eco-Friendly Bag that is used for packing different items. 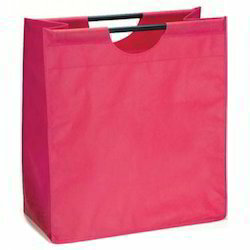 Provides bag is available in various designs, shapes, and sizes depending upon the nature of the material to be packaged. We offer an exclusive range Elegant Loop Cut Bag that are available in hand loops and is widely useful in carrying various kinds of products. These are manufactured using high quality raw materials that meets international quality standards and are widely demanded due to high durability, excellent service life and reliability. 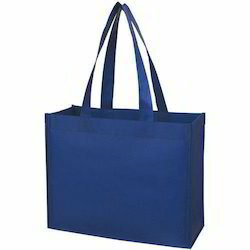 We are a leading manufacturer and supplier of a wide range of Environment-Friendly Bag. These bag material are manufactured using the high-quality raw material. These can also be used for packing food grains. We ensure that our products are in compliance with all the national and international quality standards. Our firm specializes in providing our prestigious clients a quality assured array of Footwear Bags that are manufactured using excellent quality raw material and ultra-modern technology, in compliance with industry defined standards. Used for the packaging of footwear, our offered bags are tested on various parameters under the guidance of our quality experts. 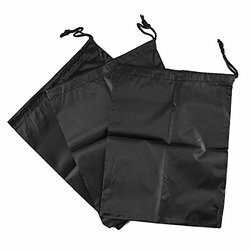 We have emerged as the foremost manufacturer and supplier of Heat Sealed T-Shirt Bag. The offered bags are manufactured by our adroit professionals using good quality raw material and advanced tools. Furthermore, we offer these products in various sizes and shapes at pocket-friendly prices. sed for packing and storing garments in different places, these bags are cross checked at strict parameters by our quality controllers. 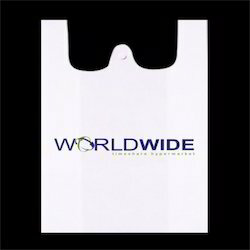 We manufacture and supply a comprehensive range of Non-Woven Promotional Bag that are made of reusable and Eco friendly propylene. These Non Woven Bags are widely demanded owing to their features of durability, liquid resisting and dehumidifying nature. Our range is available in varied thicknesses and colors to suit diverse requirements of clients. By keeping track with the market development, we are offering optimum quality Retail Printed Bag. The offered bag is manufactured using high-grade polypropylene material and latest technology. Backed by a highly adroit team of professionals, we have established ourselves as leading manufacturer and supplier of Shopping Bag. Offered bags are preferred choice for packaging different items in various shops and showrooms. We are recognized as one of the most valued Ultrasonic welded Non-Woven W / U Cut Bags manufacturers in the country. 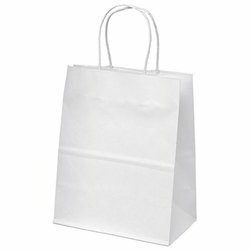 Some of the essential features of our non-woven bags are high strength, maximum space, and cost effective prices. These bags are used as sweet carrier bags. Sizes: 10"x12", 13"x16", 16"x20", 18"x18", 22"x22", 20"x24", 24"x30"
Our company is engaged in offering a wide range of Sweet Packing Bag to all our customers. With compliance to the international quality standard, we manufacture and design these Sweet bags. The raw materials used are of best quality and are procured from most trusted vendors. 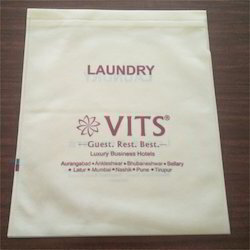 We are also involved in manufacturing a wide collection of White Fabric Bag, which has high tear strength. The products developed using these rolls are durable and have high strength. Our offered rolls are reusable and can be availed at reasonable prices. We are involved in supplying a wide range of Bags Set, which is developed using quality grade fabric. These are ideal for storage of perishable & non-perishable commodities and hence are in high demand. 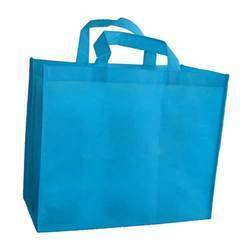 Non-woven loop handle bags are available in various colors with elegant loops available in different sizes can be used as a beautiful shopping bags. 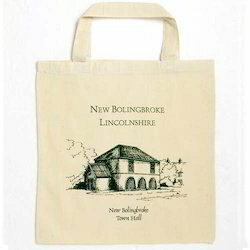 Flexographic printing is possible on Loop handle non-woven bags. 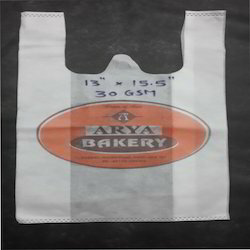 These bags are ultrasonically welded automatically stitched non-woven bags, so they are very much cheaper option compared to manually stitched bags. We offer our clients an exclusive range of Garment Bag that is available in various sizes, colors and designs. These fashionable designer bags are crafted by our skilled designers who have years of experience in this domain. The raw materials used are of best quality and are procured from most trusted vendors. Excellent strength and finishing, light weight, water repellent are some of great characteristics of these kinds of bags. Sizes:10"x12", 13"x16", 16"x20", 18"x18", 22"x22", 20"x24", 24"x30"